Submitted by: W. W. Norton & Company, Inc. In 2005, John Ruggie received an almost impossible mission. Kofi Annan, Secretary General of the United Nations, asked Ruggie to research corporate human rights abuses committed around the world—from the effect of environmental degradation on local populations to forced labor—and, if he could, to find solutions. He tells his story—and his struggle to fill this particular pair of shoes—in his new, eagerly anticipated book, JUST BUSINESS: Multinational Corporations and Human Rights [W. W. Norton & Company; March 25, 2013; $24.95 hardcover]. Even where national laws exist to stop abusive conduct, many countries fail to enforce them because they lack the capacity, fear the competitive consequences for doing so, or because their leaders subordinate public good for private gain. Governance gaps provide permissive environments for wrongful acts by companies. Others had tried and failed to solve the problem. The efforts of the UN to create a binding set of standards backed by international law failed. Corporate initiatives to create “social responsibility” standards also failed to go far enough. “The two sides, corporations and activists, were locked in a stalemate,” writes Ruggie. Ruggie and his team created a set of United Nations human rights standards for business that can be deployed in myriad ways by governments, corporations, and human rights activists for people adversely affected by companies. His heterodox approach “recognizes, better interconnects and leverages the multiple spheres of governance that shape the conduct of multinational businesses,” he says. With the help of his “Protect, Respect and Remedy” Framework and “Guiding Principles” to implement that framework, two bodies of thought once locked in opposition—the pursuit of corporate value and advocates of human rights values—are now beginning to converge. When Ruggie presented these Guiding Principles before the UN Human Rights Council, he said, “Here you have an instrument, the Guiding Principles, that you could have never negotiated yourselves. . . . Seize the opportunity. Endorse it.” They did. Unanimously. Companies have begun to align their practices with the Guiding Principles, widely known as “the Ruggie Rules.” Advocacy groups and workers’ organizations use them in their campaigning governments around the world and are drawing on them to inform their own policies and laws. They have even featured in a crucial case before the Supreme Court. Ruggie recognizes that this is only the beginning. 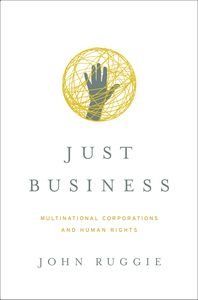 JUST BUSINESS tells the story of one man’s challenging task to create a feasible yet ethical approach to the future of global business and human rights. John Gerard Ruggie is the Berthold Beitz Professor in Human Rights and International Affairs at the Harvard Kennedy School of Government. He lives in West Newton, Massachusetts.